In the hit Korean drama, “My Love from the Star” (별에서 온 그대), the main female character, Cheon Song-yi, likes chimaek (치맥) very much. Chimaek is the short form for fried chicken (치킨 – pronounced as “chikin”) and beer (맥주 – pronounced as “maekju”) generally used among the younger generations. Due to the popularity of that Korean drama in China, chimaek has also become a popular Korean food there. It was said that customers needed to wait in line for 3 hours to order fried chicken at some Korean fried chicken restaurants in Shanghai and Beijing. In fact, Koreans like fried chicken very much – they can easily have fried chicken either in fried chicken restaurants or by home delivery. In South Korea, there is even a “Chicken University” offering courses on how to cook fried chicken and run a fried chicken restaurant and doing research and development projects on new varieties of fried chicken – you can refer to my blog post dated 28 November 2014 for details of the “Chicken University”. How did chimaek become popular in South Korea? Initially, chicken were used to make samgyetang (ginseng chicken soup) in Korea – you can read more about samgyetang in my blog post dated 16 April 2015. After the Korean War, the U.S. armies stationed in various cities in South Korea, one of which was Daegu. As the Americans liked fried chicken, the Koreans developed recipes for fried chicken and established fried chicken restaurants near the army camps in Daegu to cater for these American customers. Starting from the 1970’s, Daegu became the main chicken raising city in South Korea and nearly 80% of chicken came from Daegu. In the 1960’s and 1970’s, with increasing urbanization, fried chicken became a convenient food for workers in factories and offices in the cities. In the 1970’s, draft beer started to become popular and with the promotion of sports events by the Korean government in the 1980’s, chimaek has become a combo consumed by the Koreans while watching the sports events. Moreover, the two appears to be a good match because the beer can reduce the greasiness of the fried chicken. The 2002 World Cup co-hosted by South Korea and Japan further accelerated the growth of the fried chicken industry in South Korea. During the 2006 and 2010 World Cup games, sales of chicken and beer almost doubled compared to the same period in the previous year. However, similar effect was not noted for the 2014 World Cup games as the games were played during early morning hours of South Korea and chicken and beer seemed more appropriate as a late night snack than an early morning meal. On the other hand, chimaek has also become a favourite food choice for gatherings with friends. 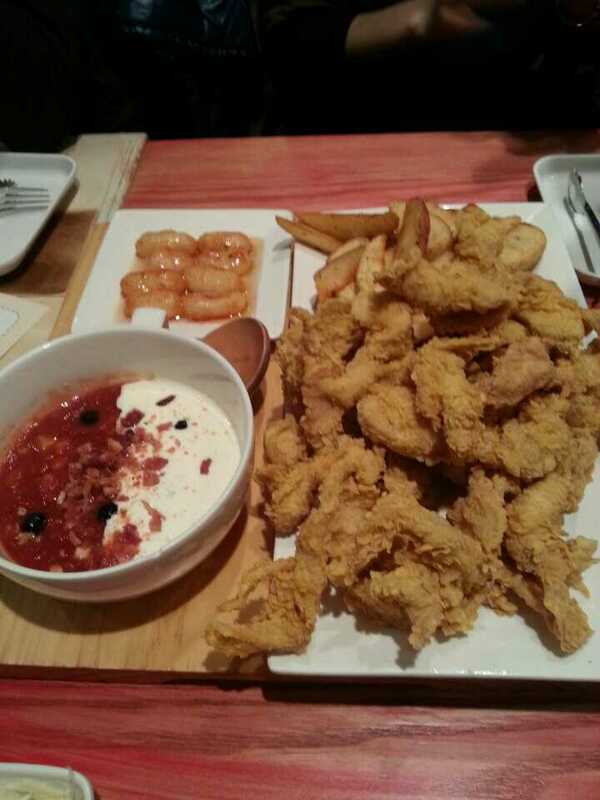 There are now many different fried chicken menus in South Korea, for example, restaurants offering special cuts only (like drumsticks, wings, chicken breast or the whole chicken), different flavours (like honey, garlic, red pepper paste, green onion, soy sauce), and bone-in/boneless fried chicken. Why do Korean fried chicken taste so good? Korean fried chicken is crispy but not dry. They are fried not once but twice with a relatively low oil temperature of 350 degrees. The chicken is cooked in two separate stages: the chicken is first cooked for 10 minutes and then removed from the oil and shaken vigorously in a wire strainer to cool for about 2 minutes. This can prevent the crust from getting too brown before the meat is cooked through. Then, the chicken is cooked for 10 more minutes until it turns into golden-brown and is done. This frying technique helps drive out the fat in the skin and transform it into a thin and crispy crust and also makes the chicken less greasy. On the other hand, the Koreans raise smaller breeds of chicken since such breeds are used in cooking samgyetang – the average weight of Korean chicken is 1.5 kilograms (vs. 2.5 kilograms for chicken raised in the U.S. or other countries). So, the whole chicken can be fried evenly and the chicken meat is also more tender. In July 2013, Daegu city held the first chicken and beer festival, the Daegu Chimaek Festival, to help the local chicken industry which was adversely affected by the avian flu. The festival has now become a major annual summer festival for the young people. In 2014, the festival attracted 620,000 visitors (vs. 270,000 in 2013). During the festival, visitors can try complimentary chimaek offered by different establishments, enjoy pop music performances and watch or participate in various contests (like drinking contest, chicken sauce contest, spicy chicken eating contest). In 2014, a total of 350,000 chicken (including those offered as free samples) worth 6.3 billion won and about 2 billion won worth of beer and soft beverages were sold during the festival period. The K-pop singer, Kim Jin-ho, sings a song entitled “치맥” (Chimaek) – it is a song with light and relaxing tempo and goes well with the mood when having chimaek with friends. You can watch this video to listen to the song – in the video, you can also see the usual ways of enjoying chimaek by the Koreans such as watching sports events and gatherings with friends. Reminder: The next blog post will be published on 30 April 2015. Watch this space!